SMOOTHPROOF Serum is rated 4.3 out of 5 by 9. Share https://www.matrix.com/biolage/core/smoothproof/smoothproof-serum Biolage SmoothProof Hair Serumhttps://www.matrix.com/~/media/images/haircare/biolage/core/smoothproof/biolage_smoothproof_serum_b-sp-se.jpg Tames frizz and flyaways while adding shine. Rated 5 out of 5 by newyorkforever from Woa!...a lifetime trying to control my unruly freeze hair...finally a miracle product!..THANKS BIOLAGE!!! Rated 5 out of 5 by tianahailee from My "must have" serum! This stuff really does it all for me. I'm a black Canadian who has very coarse, unruly curls of many different curl types and I literally use this stuff for everything. If I'm wearing it curly, I use it to detangle and then again to keep my curls hydrated mixed with a leave-in conditioner. When I straighten my hair, I use it as a heat-protector to blow it dry, then again to flat iron or curl, and usually once more to smooth and finish my hair. It is the best product I've used for heat protection and frizz control (great for humidity!). It's lightweight and "buildable", and when I was a stylist for a few years, I recommended it to almost all of my clients, since a little goes a long way in fine hair and those who have a hair texture like mine can rejoice at a product that feels light but packs in lots of moisture and shine if used moderately/generously. Really a do-all serum! Rated 5 out of 5 by kam1986 from works great!! i bought this at a salon on sale to try. i have wavy curly hair and this stuff is amazing! i put just a pump and my curls look great and dont frizz! worth every penny! Rated 5 out of 5 by Jeanine from LOVE, LOVE, LOVE IT!!! Finally... a product that contains my normally frizzy hair all day, without weighing it down!! 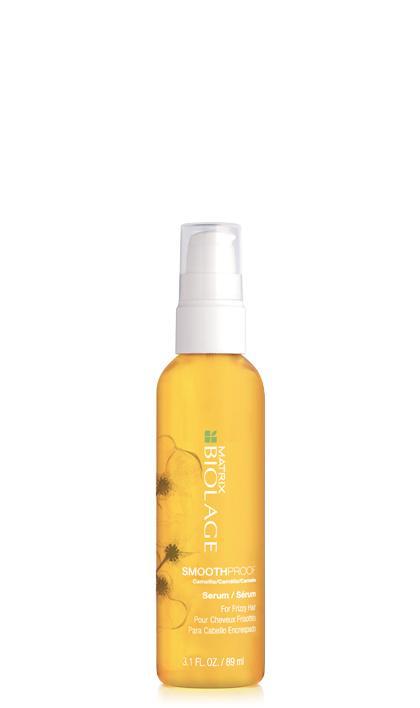 I have discovered Biolage products recently, and I just bought this one as my hair is growing out and can sometimes be a bit frizzy (due to layers and bleaching). However, this product really holds my hair in, it no longer looks frizzy, and it stays in place on a humid day!! I JUST LOVE IT!!! No more than two pumps however!! Rated 5 out of 5 by Emily Lee from Deep Smoothing Serum I love this stuff! Before using this my hair was frizzy and was impossible to control, even with a staightener! Now it is smooth and sleek! I get complements on my hair now and everyone wants to know what I use! Rated 4 out of 5 by Diksha from Deep Smoothing Serum Absolutely amazing!!! My hair used to be so frizzy and nothing could tame it. But this works perfectly well and now my hair's just sooooo amazing! Rated 5 out of 5 by Jessica Berry from Deep Smoothing Serum Smooththérapie Deep Smoothing Serum is a must have product! I have had frizzy and uncontrollable hair for years now. It didn't matter whether it was hot and humid out or the dead of winter, I would have flyaways and frizz everywhere until I started using this product. I have noticed my hair did a 360, my hair is full of life, shiney and under control now! I always get compliments now on how great my hair looks! Thanks Biolage!